Happy Friday, everyone! 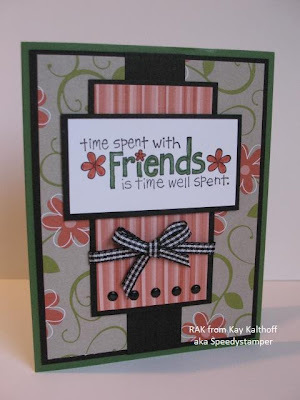 Have you been to the All That Scraps Blog lately? A new feature is Amy's Friday Sketch, and we'd love for you to play along! Here's my card for today's sketch. All images are from C.C. Designs. Lulu is from Love Ya Lots, the sentiment is from Little Penguins, and the background is Polka Dots, one of the new Big Ol' Backgrounds. The paper is from the Ba Ba Black Sheep Collection by Piggy Tales. I colored Lulu with Copic Markers, and I sponged around the image and sentiment panels. I added dots to the scallops with a white gel pen. It was a pretty quick card to make -- most of my time was spent on the coloring! 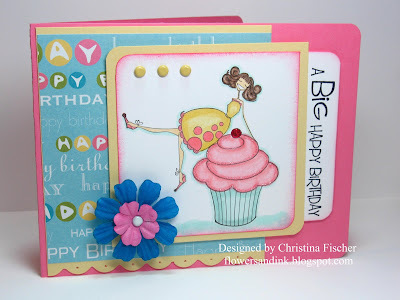 One more fun thing at the ATS Blog -- Christine is celebrating the first birthday of C.C. Designs with a giveaway! 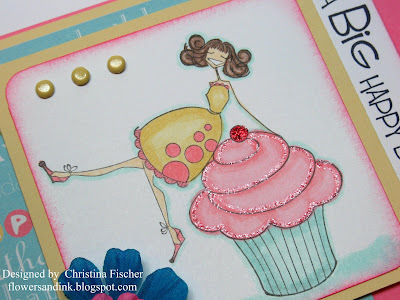 Go HERE to see how you can win all of April's stamps FREE! A Challenge Card and a New Look! Hello! 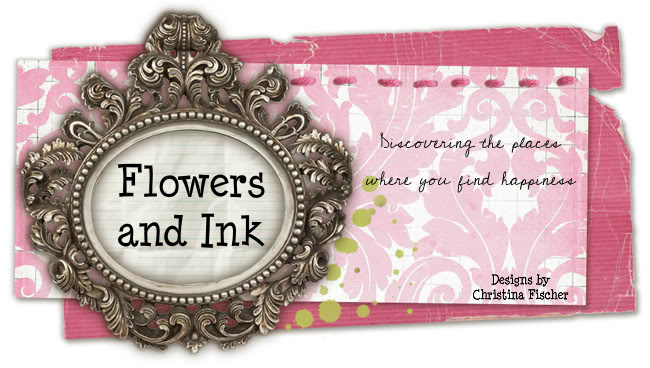 I gave my blog a facelift -- did you see my new banner? It's "me", definitely! :) Our friend Ray made it for me. Thank you, Ray!!! He and his wife Katie are incredibly talented -- Ray is an amazing artist, and Katie does beautiful floral designs. You can see some of her work HERE (her site and blog are also on my sidebar). 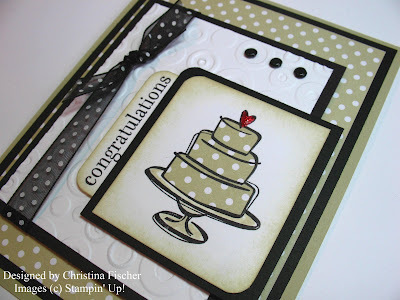 Here is a card for today's Color Challenge (Basic Black, River Rock, and Whisper White). The layout is Beate's Weekend Sketch #36. It's a pretty simple design, perfect for a wedding or anniversary. The paper is from SU! 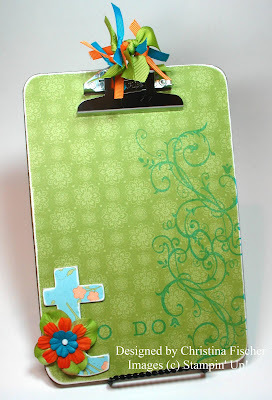 's Apple Cider, and I embossed the white panel with my Cuttlebug and Spots & Dots embossing folder. I paper pieced the cake with the paper, and I watercolored the pedestal with an Aquapainter and River Rock ink. I HAD to add some red Stickles to the heart atop the cake! Happy Monday! 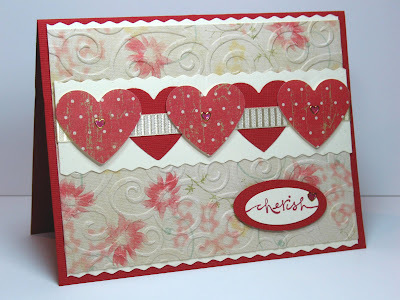 Here's a card I made for today's Technique Challenge -- using mixed patterns of paper (two or more). I pulled out some Piggy Tales Ba Ba Black Sheep paper and thought it would make a fun birthday card. Cakeabella is colored with Copics, and her apron is paper pieced. I added some red Stickles and some white Liquid Applique to the cake. There are Sugarcoated Brads through the Prima flowers, and the two-tone pink ribbon is from May Arts. Hi, everyone! I hope your weekend has been great so far! We're enjoying a leisurely Sunday at home -- that doesn't happen for us very often! I got to spend a little time cutting up some new rubber from Cornish Heritage Farms. I really think there's something therapeutic about trimming a new set of stamps -- does anyone else feel that way?!? This set is Silhouette Blooms I, from The Kim Hughes Collection. As soon as I finished trimming it I wanted to ink it up right away. I picked up a scrap of paper (from the Kaleidoscope 12x12 pack by My Mind's Eye), and I built the card around it. I don't think this is my usual style or colors at all, but I do like it! 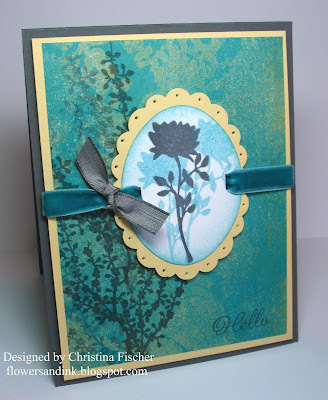 I stamped the sentiment and one of the flower images on the paper in Basic Gray ink, stamping off a few times also, and I stamped the other image on the oval in Taken With Teal and Basic Gray. I sponged around the oval with Taken With Teal, and I pierced the scallops. The ribbon is Basic Grey taffeta and retired SU! velvet. The panels are mounted on dimensionals. Anyway, here's the card I did for yesterday's Ways to Use It Challenge at SCS. Believe it or not, this was the first time I'd done any type of window on a card. When I was cleaning and purging last weekend, I found some transparency sheets in a box of office supplies, so I guess the time was right! Here's how I created the card. I attached the patterned paper to the card front, and I attached a piece of Whisper White cardstock to the inside of the card. I then opened the card and placed it face-up on a cutting mat. I cut a circle (about 2 1/4") out of the cardfront using a Fiskars Circle Cutter (my Marvy punch wouldn't reach to the center of the card). Then I cut the same size circle from a piece of Lavender Lace cardstock and put the cardstock aside. I adjusted the circle size on the cutter and cut a slightly larger circle from the transparency sheet. 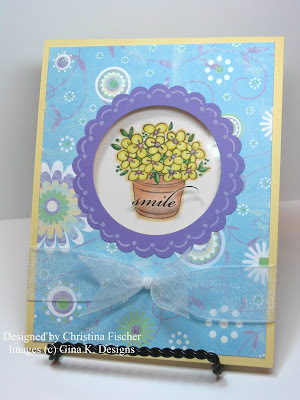 Before attaching the transparency, I closed the card and stamped the pot of flowers (from Baskets of Happiness by Gina K. Designs) through front circle onto the white cardstock. I then used a Quickie Glue Pen to adhere the transparency to the card front over the center circle. Then I went back to the Lavender Lace cardstock. 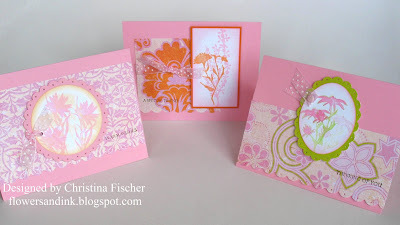 I used Scalloped Frames and Doodles to stamp the doodles around the cut-out circle in White Craft ink. When the ink was dry, I took a Marvy Giga Scalloped Circle Punch and punched around the stamped doodles, giving me a scalloped frame for my window. I attached it over the transparency on the card front. I took the word "smile" from the Eastern Elegance rubons and applied it to the transparency, so it is visible over the pot when the card is closed. Then I opened the card and colored the image with Copics. 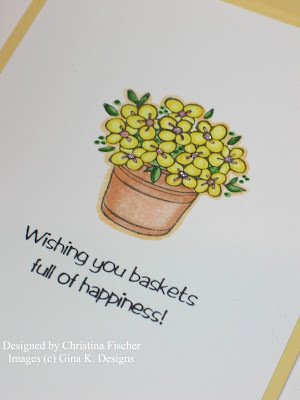 I added some Stardust Stickles to the flower centers, and I stamped the sentiment in Basic Black ink below the pot, so it is visible only when the card is open. 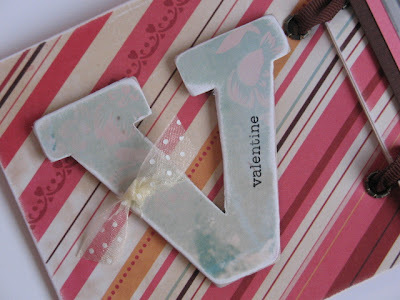 I tied some white organdy ribbon around the bottom of the card to finish it. Hello! 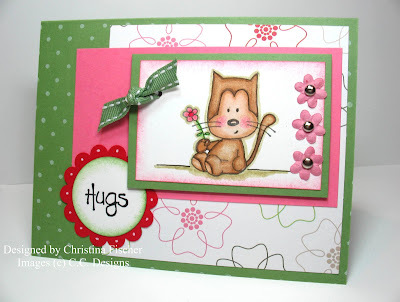 Here's a card I did for the Sketch Challenge at SCS and also for Celebrate MFT Day. 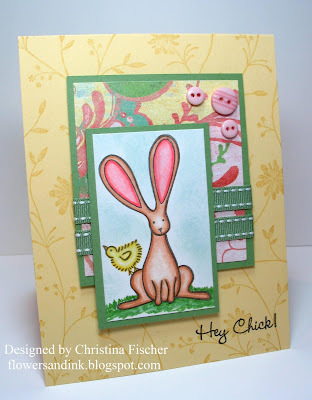 I looooove this set -- is this bunny cute or what? It's perfect paired with the Two Scoops paper. 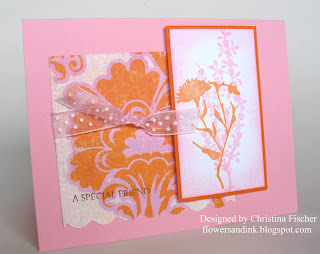 The background stamp is Pretty Petals, which is becoming one of my favorites. I colored the images with Copics, and I sponged Soft Sky around them. The panels are popped up on dimensionals. A simple sketch, nothing too complicated, but I love how it turned out! Hi there! I hope you are well! We woke to two inches of snow and school delays, but ALL the kids went back today! No more sick ones!! YAY! I do have a card to share today. 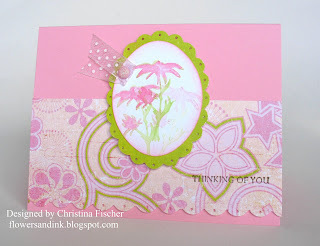 Yesterday I was visiting Tricia Traxler's blog, Simply Stamping, and she had a challenge to use polka dots. 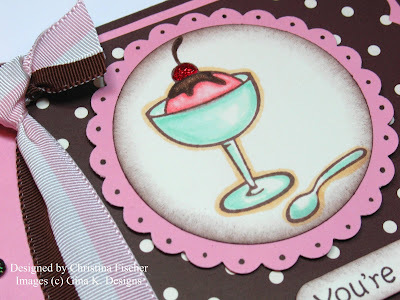 Since I am trying to use some of my neglected supplies, I pulled out some retired Au Chocolat paper and paired it with Gina K.'s Stamps for a Cause set, How Sweet It Is. $7 from each set sold goes to help those who live with Diabetes. 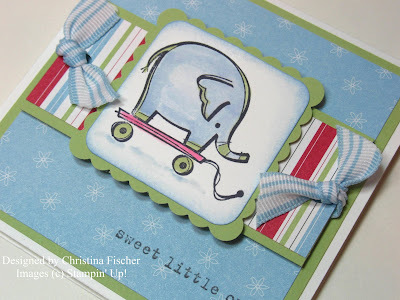 Gina is truly one of the most generous people in the stamping world! The ribbon (from my friend Traci) pulled the card together for me. I colored the image with Copics and added some sparkle to the cherry with some Xmas Red Stickles. I didn't have brown brads, so I made my own "sugar coated" ones: while holding them with tweezers, I tapped them onto Chocolate Chip Craft ink, dipped them in Iridescent Ice EP, then used a heat tool to set it. 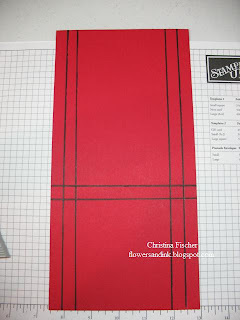 I made the scalloped edge on the dotted paper by removing the paper guide from my corner rounder. I rounded the ends of the sentiment panel with the corner rounder as well. Hello! I have a baby boy gift I want to share with you. 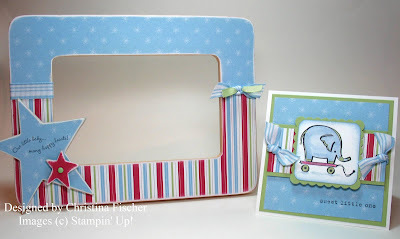 This is a frame and card I made for my neighbor. When I was trying to decide on paper to use, I realized that Cutie Pie would be perfect. I had never really thought about it as "boy" paper, but it has a nautical look to it, don't you think? I paired it with the chipboard stars on the frame, and I really love it! The frame is an unfinished wood frame I purchased at Michaels for about $2. Altering frames is becoming one of my favorite things to do -- just apply paper, sand the edges, and embellish! Here's a closeup of the card. Year After Year and Holidays and Wishes are stamp sets that have been way too neglected, but they're so perfect for those "occasion cards," and the images are fun for coloring or paper piecing. Here I watercolored the elephant with an Aquapainter and inks. I am loving the new SU! striped grosgrain -- it ties so nicely and feels so soft. It's lots of fun to work with! Happy Monday! Well, at least I hope it's a happy one! Our week isn't off to the best start. I have two sick kids (one started vomiting at midnight, the other at 8am), so I wanted to sneak in this post while both of them are sleeping! The other two kids had this "bug" last week, so now we'll just hope that Chris and I can dodge the bullet! I wanted to share this Bella card with you. I just got her last week from Stamping Bella, and I couldn't wait to ink her up! 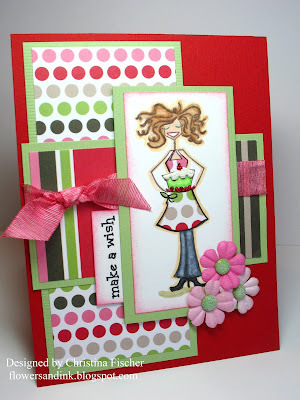 This was a fun card to make -- I really need to get my Bellas out more often!! 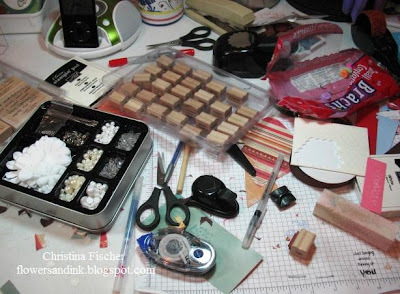 :) I'll just leave you with the supplies -- if you have any questions, just ask! I'm off to check on my sick ones -- have a great day! The first item is a 9x6 inch clipboard. It was part of a 3-pack I purchased at Staples several months ago. I turned it into a "to do list" holder, so I can keep better track of my projects and deadlines. I covered the clipboard and the chipboard "t" with SU! Bali Breeze paper. Then I stamped over it using Baroque Motifs and Simple Type Alphabet (retired). 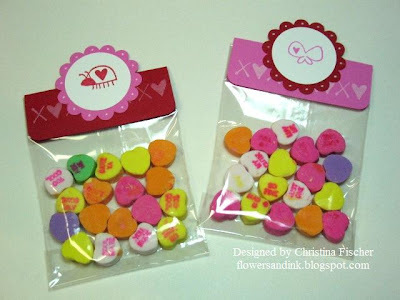 I had grosgrain ribbon and Primas that matched perfectly, so I used them for embellishments. The clipboard is now hanging on the wall above my table, so I can't escape the list! Gotta go get a start on that table -- thanks for checking in! Happy Friday -- have a great weekend!! 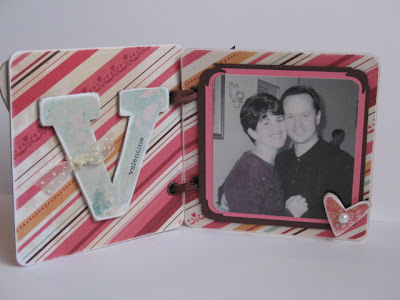 For this project I got out my much-neglected chipboard and had lots of fun with it! 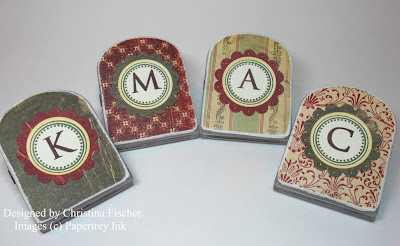 I used 4" chipboard coasters and SU! On Board chipboard. The coasters are held together with 5/8" Chocolate Chip grosgrain tied through SU! Jumbo Eyelets. 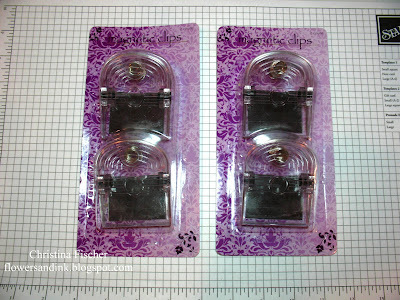 I used a Crop-a-dile to set the eyelets. The paper is Cosmo Cricket Hey Sugar (I *love* that paper), and the cardstock around the photo is SU! Regal Rose and Chocolate Chip. I adhered the paper to the chipboard and sanded the edges with a sanding block. I used Everyday Flexible Phrases on the chipboard "v", and I embellished with somedotted May Arts ribbon and half-pearls from the SU! Pretties Kit. To add some subtle color to the black & white photo, I simply colored over our sweaters with Prismacolor Pencils. I also added a little light pink to my cheeks, but it doesn't show up that well in the photo. I had seen Dawn Lusk do coloring on this photo in the Cornish Heritage Farms gallery, and I thought it was such a cool detail! She used Copics on hers, but I thought I'd try it with the pencils. Thanks for the idea, Dawn! I am so happy with how this turned out!! I hope he'll love it as much! :) We don't have anything big planned for tonight -- we're going to get some carry-out and watch LOST downstairs after the kids are in bed. We try to have a "basement date" at least once a week -- sometimes it's the only time we have a chance to catch up with each other! With four children and a crazy schedule, we have to do the best we can! ;) I hope you have a great night -- thanks for stopping by! Whew! I finally finished the Valentines for school! 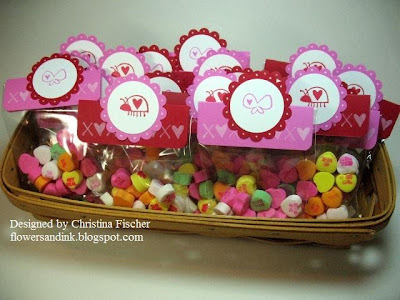 Caroline needed treats for her preschool class, so this is what I made for her. I wanted to do something that was cute but easily mass-produced, and the images from Hugs and Kisses (from the Kim Hughes Collection by Cornish Heritage Farms)were just what I needed! The bags are small cellophane bags from SU!. 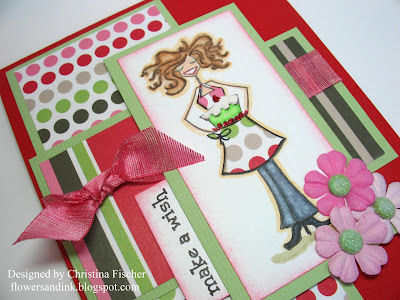 Cardstock is Pixie Pink, Real Red, and Whisper White. Ink is Pixie Pink, Real Red, and White Craft. I used a corner rounder on the toppers. The dots on the scallops were done with a Marvy white gel pen. 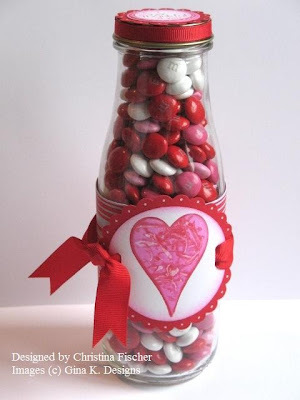 A few weeks ago I saw this post on Cammie's Blog, and I knew I wanted to make this bottle. I just loved the look of all those m&m's inside! 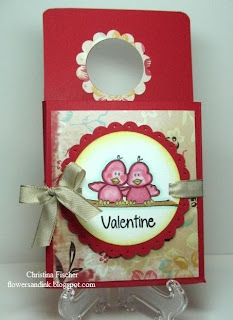 :) For this project I used stamps from Gina K. Designs. The solid heart is from the Stamps for a Cause set Love You to Pieces, and the sentiment on the lid is from Punchy Words. 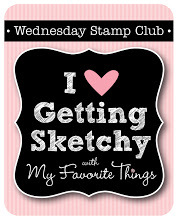 The large heart was a perfect stamp to use for today's Wednesday Tutorial on SCS -- Faux Shaving Cream. I used Pixie Pink and Real Red ink. Cardstock is Real Red and Whisper White. The paper band around the bottle is BasicGrey Romani. So, now I can show you the Valentine card I made today. I really like it! Since it's so monochromatic, I made sure I added interest by using a lot of texture and dimension. I used the SU! background stamp Tres Chic to stamp on the BasicGrey Two Scoops paper with White Craft ink. 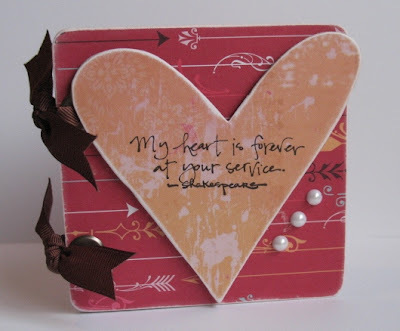 Then I heat embossed it with white embossing powder and punched out the hearts with a Marvy Mega Heart punch. I mounted the first heart directly to the Cuttlebugged panel (SU! Kraft), then I attached the second heart over it with dimensionals to separate them and add more dimension. 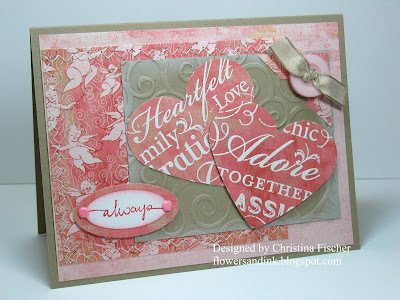 I zig zag stitched around the Two Scoops cupid patterned paper, and I used the same paper to punch out a photo corner. I tied some SU! Kraft taffeta ribbon through a Two Scoops button, then I placed it over the photo corner. 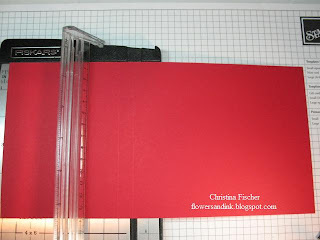 The sentiment is stamped in Ruby Red on Whisper White cardstock. I added brads to the ovals and mounted them on dimensionals. 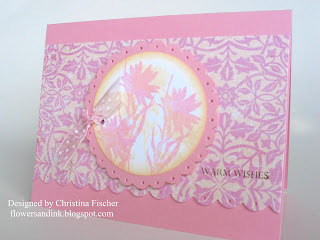 I sponged around the Kraft panel with White Craft ink, and I sponged around the small oval with Pretty in Pink. Just a reminder -- the new C.C. 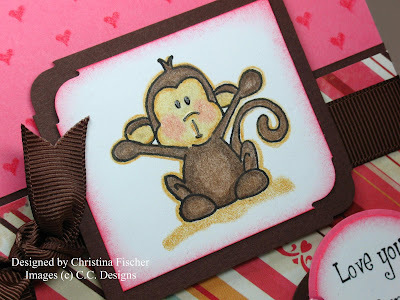 Designs set Monkey Love and three new backgrounds are now available at All That Scraps! Happy Friday! 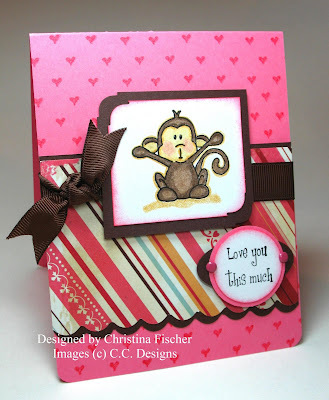 Here's another peek at the Itzie Inkies Set Monkey Love by C.C. Designs -- it will be released at All That Scraps tomorrow (Saturday) night at 10 pm. 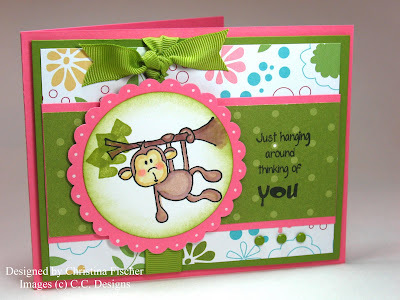 This is the other monkey in the set -- I just love how he's hanging from the branch! I stamped the image and sentiment in Basic Black ink, then I watercolored with an Aquapainter and inks. His cheeks were colored with a Prismacolor pencil. To make the leaves, I stamped the heart from Love Ya Much upside-down with Old Olive Ink. I also used Old Olive to sponge around the edge of the circle. 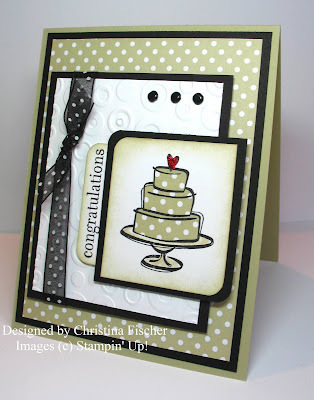 I added dots to the scallops with a white gel pen, then finished the card with Old Olive ribbon and brads. Okay, is this little monkey cute or what?!? He is part of the new Itzie Inkies set Monkey Love, which will be released by C.C. Designs this Saturday at 10 pm. There will also be three new backgrounds released -- hearts, plaid, and polka dots! Here I used the hearts background. The image and sentiment are stamped in Basic Black ink, and I colored the monkey with Prismacolor Pencils blended with Turpenoid. I added Sakura clear Gloss Glaze Pen to his eyes, nose and mouth. I used a corner rounder on the image panel, bottom corners, and to make the scallops. Now, let me show you my happy accident! 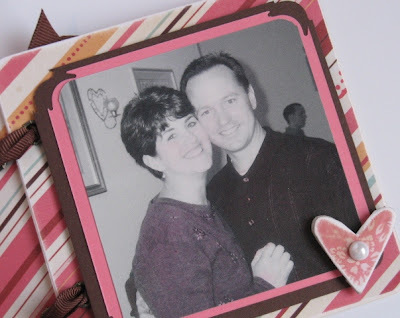 I used the corner rounder on the image panel, then had a senior moment and clipped the same corner again (I'm over 40 -- those things happen quite often now). What I got was this cool decorative corner! I think I'll be using that little trick again! 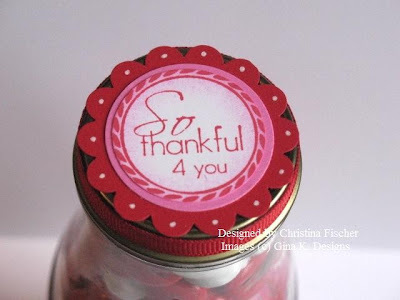 :) The sentiment is layered on circles and an oval, and I added some brads for more interest. 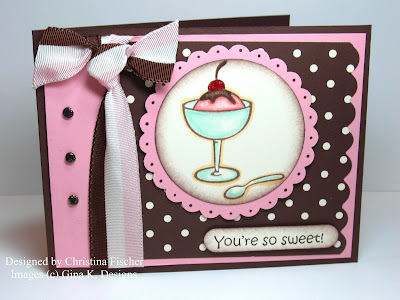 Some of my favorite Chocolate Chip grosgrain finishes the card. I hope you'll come back tomorrow to see the other monkey in the set -- he's just "hanging around" waiting to meet you! 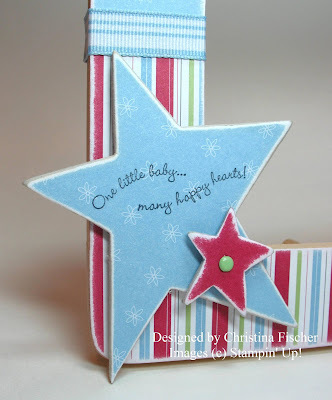 ;) Also, stop by the new All That Scraps Blog -- check out the first post to see how you can win a Marvy punch! Thanks for stopping by -- have a fantastic day! 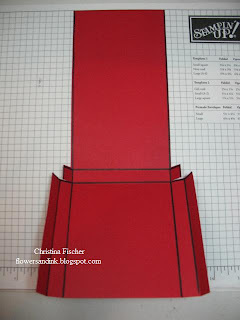 Start with a 5 1/2" x 11" piece of cardstock. Turn it sideways and score at 4" and 4 1/2". 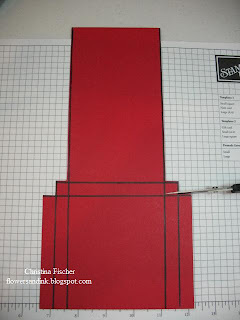 Then turn it lengthwise and score at 1/2", 1", 4 1/2", and 5". 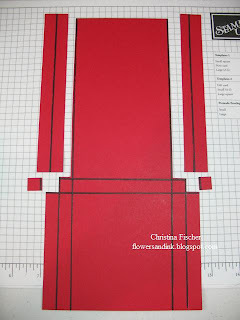 Cut away sections of cardstock as shown here. 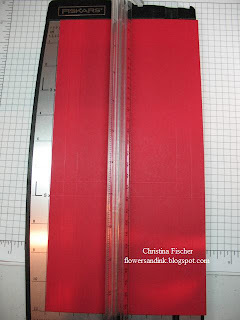 Then cut a slit on both sides as shown here, so the squares become small tabs. If you fold at the score lines it should look like this! Round the corners of the long back panel. 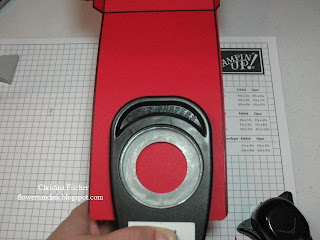 Then punch out a circle so it can slip over a bottle. Here I used a 1 3/8" circle punch. 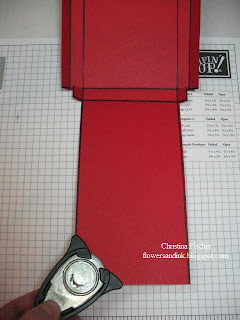 Fold up and attach with Sticky Strip or other strong adhesive. Embellish as desired. 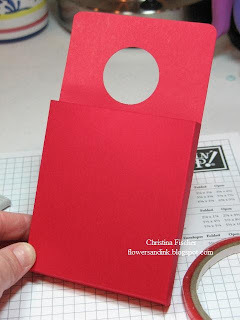 If you want to you can stamp on the cardstock before assembling the pocket. Here I used Cosmo Cricket Hey Sugar paper for the front panel and the scallop around the hole. To create the scallop, I punched out a 1 3/8" circle, then punched around that circle with a Scalloped Circle punch (SU!). The images are from Love Ya Much by C.C. Designs. I colored the birds with Copics. I used a Mega Circle Punch and Giga Scalloped Circle Punch (Marvy Uchida), then I pierced the scallops. I punched two openings with a SU! handheld rectangle punch, then tied on some SU! Kraft taffeta ribbon. 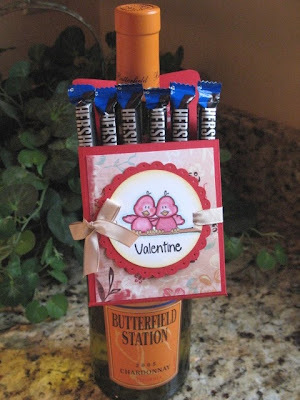 *Cut the front and back panels shorter, then fill with "drinks on the go" packets and place over a water bottle. *Make the hole larger and place over a doorknob. What a great way to surprise a neighbor or friend! Perfect for those Halloween "Boo" treats, too! * Fill with cocoa, candy bars, whatever!! That's it -- pretty simple! Try one! If you make a treat pocket for yourself, link back here so I can see it! :) Thanks so much for visiting -- have a fantastic day!